Children are our future, our refflection on this world. The morals and beliefs, experiences and what they have thought us, our respect for nature, our tolerance. These and many more are the factors, experiences that raise caring, loving people that will build a better world. At Children of the Universe your child will be able to communicate with and learn from children from all over the world. Exchanging cultural knowledge and haveing the opportunity to show their tallent in a fun and loving environment, aswell as gaining confidence amongst others. Developing socially, artisticaly and caring for the world is the main goal of Chilren of the Universe. The event takes place each year in the middle of June within the period of 7 days in 5 age groups - boys and girls from the five continents. 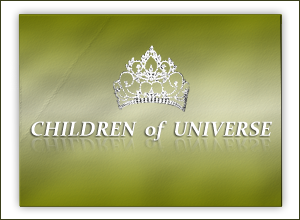 Become a part of Children of the Universe!